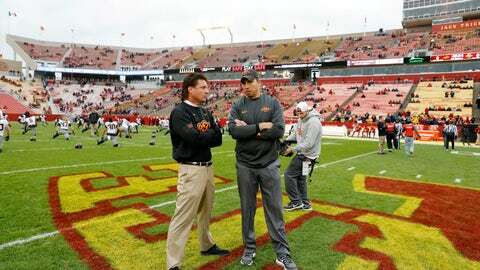 Before the season, Kansas State and Iowa State seemed like they had a somewhat reasonable chance to compete for a spot in the Big 12 title game. The Wildcats even got two first-place votes in the preseason poll, same as West Virginia. The punchless Wildcats and Cyclones are already in danger of falling out of the league race. Iowa State (1-3, 0-2 Big 12) and K-State (2-3, 0-2) entered October at the bottom of the conference standings with Kansas. It’s no surprise that Jayhawks (2-3, 0-2) are in the conference cellar. But the Cyclones and Wildcats have failed to live up to expectations, particularly on offense, and their schedules only get tougher over the next few weeks. The Cyclones face No. 25 Oklahoma State (4-1, 1-1) on Saturday, while Kansas State hosts Baylor (3-2, 1-1) in a game it can’t afford to let slip away. Kansas State (19.6 points per game) is one of just five Power Five programs averaging less than 20 points, and it has managed a league-low 20 points in the Big 12. The Wildcats have vacillated between quarterbacks Skylar Thompson and Alex Delton, who’ve combined to complete just 53.3 percent of their passes. Snyder snapped at a reporter this week after being repeatedly asked about the two. “You write what the hell you want to write,” said Snyder, whose team travels to No. 7 Oklahoma (5-0, 2-0) and TCU (3-2, 1-1) after hosting the Bears. Iowa State lost quarterback Kyle Kempt to a knee injury in its opener. While sophomore backup Zeb Noland has shown promise at times, the Cyclones are last in the league in scoring offense (18.4 ppg). Noland threw for just 79 yards in last week’s 17-14 loss to the Horned Frogs on the road. Those are numbers Noland will need to improve on if Iowa State can’t get Kempt healthy to play during an upcoming stretch that includes games against No. 9 West Virginia (4-0, 2-0) and Texas Tech (3-2, 1-1). Kansas seemed like it might be in position to be at least competitive in the Big 12 after beating Central Michigan and Rutgers by an average of 32.5 points. In league games, it’s been the same old Jayhawks. Kansas (2-3, 0-2) has been outscored 74-35 by Baylor and Oklahoma State. The Cowboys exposed KU’s offensive line last week, sacking Carter Stanley five times and recording nine tackles for loss overall. The Jayhawks play at West Virginia on Saturday as a 29 ½-point underdog. The Sooners face No. 19 Texas (4-1, 2-0), winners of four straight, in a crucial league matchup on Saturday. Texas Tech and TCU have the weekend off before they play each other in Fort Worth next Thursday.